Space… I can’t say that word without continuing…the final frontier. I love Star Trek, all generations, except for maybe Voyager, sorry Janeway. Space can be a dangerous place (see Gravity) but we are fascinated with it. The giant telescope Hubble is constantly gathering information, it is analyzed and theories are formed and tested. The other day I heard an interview with Astronaut Chris Hadfield, literally wisdom from space. It was in the following excerpt from his interview on NPR, the Hubble of gathering interesting things, that I analyzed Chris’ info and apply it to the equally dangerous and scary space of youth ministry. My notes will be in italics between the quotes. HADFIELD: Terry, I found it to be so helpful in my regular life, and I didn’t mean it to be that way. But of course as an astronaut, especially during launch, half of the risk of a six-month flight is in the first nine minutes. So as a crew, how do you stay focused, and how do you not get paralyzed by the fear of it? Imagine you are being interviewed by Terry Gross about your youth ministry and she asks you, “how do you stay focused and not get paralyzed by the fear of it?”. How would you answer that? 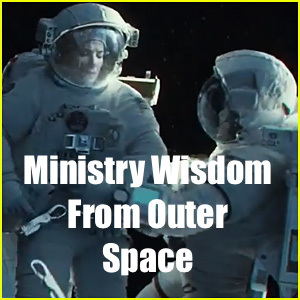 Yes, you ‘d probably say prayer and Bible reading because you were taught to say that but when you are doing youth ministry there are times when neither of those things seem to help us, it like we’re Sandra Bullock in the movie Gravity and find ourselves drifting away from our mission into oblivion. What then? Wisdom Point # 1 from outer space: Every mission needs a crew. There can be lots of buttons to push and levers to pull, you don’t be in charge of everything. And the way we do it is to break down what are the risks. And a nice way to keep reminding yourself is what’s the next thing that’s going to kill me. And it might be five seconds away, it might be an inadvertent engine shutdown, or it might be staging of the solid rockets coming off, or it might be, you know, some transition or some key next thing. We’ve already, say, had one computer fail, and we’ve had one hydraulic system fail, so if these three things fail, now we’re, you know, we need to react right away, or we’re done. General irresponsibility that could get kids hurt (driving while tired, etc. Those are things that could kill me professionally, spiritually, etc. and I often envision headlines, o Faebook posts like “Wow! I thought Paul Turner was the real deal, guess not.” . I also imagine my wife and family’s reaction, etc, if ever did anything to shame them. Those headlines and potential reactions keep me and the church I serve, on mission and out of harms way. not communicating with parents my pastor, etc. I think of disappointed kids, angry parents, and a strained relationship with my pastor. Those thing would kill me internally with stress and doubt. So we don’t just live with that, though. And the thing that is really useful, I think, out of all this is we dig into it so deeply, and we look at OK, so this might kill us. This is something that would normally panic us. Let’s get ready. Let’s think about it. And we go into every excruciating detail of why that might affect what we’re doing and what we can do to resolve it and have a plan and be comfortable with it and practice is. GROSS: And you say in order to make this work, you have to neutralize fear. HADFIELD: Yeah, but, I mean, it’s not like astronauts are braver than other people. We’re just, you know, meticulously prepared. We dissect what it is that is going to scare us and what it is that is a threat to us, and then we practice over and over again so that the natural, irrational fear is neutralized. Key phrases :”Meticulously prepared” and “Neutralizing fear”. Both of these are disciplines that I do my my best practice. HADFIELD: And your first reaction is not just to scream and flee with your hands waving over your head, but in fact, to go hey, we thought about this, and I know that this is dangerous, but there are six things that I could do right now, all of which will help make things better. And it’s worth remembering, too, there’s no problem so bad that you can’t make it worse also. HADFIELD: So you have to practice and learn what’s the right thing to do. But given that, it actually gives you a really great comfort. It’s counter intuitive, you know, to visualize disaster, but by visualizing disaster, that’s what keeps us alive. What is the next thing that could kill you or your youth ministry? Will playing out the worst possible scenario in your ministry help you firm up your ministry discipline?